Happy Meatless Monday! Last week, we posted this photo (via Facebook and Twitter) of our delicious vegan dinner — here’s the recipe if you want to make it at home. Quinoa (pronounced KEEN-wah) is a seed rich in protein and high in fiber. Commonly used as a substitute for grain, quinoa is actually not a grain at all and is related to Swiss chard and spinach! It’s easy to prepare – just rinse, drain, and throw in a pot with water in a 1 part quinoa to 2 part liquid ratio. However, we prefer to use vegetable broth instead of water for added flavor. 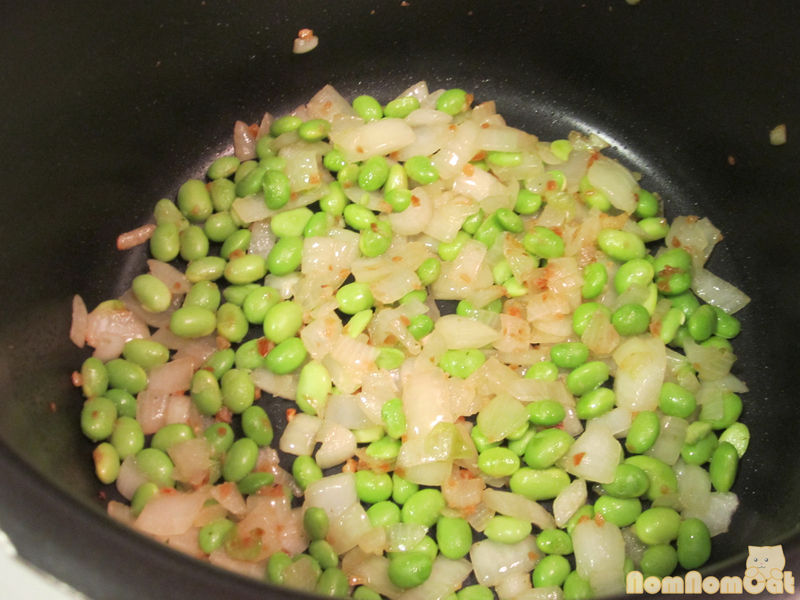 Bring to a boil and let simmer for about 10-15 minutes until all of the liquid has been absorbed. The quinoa should have a firm but slightly chewy texture when done. It is deceptively filling, so we abide by the serving size of 1/4 cup (dry) per person. Kale is a beautiful dark green leafy vegetable rich in vitamins A, C, and K. I’ve always been mystified by how to cook it (it’s not a common ingredient in Asian cuisine), but we put together a sauteed kale dish that turned out similar in flavor and texture to the sauteed gai lan in Chinese restaurants. 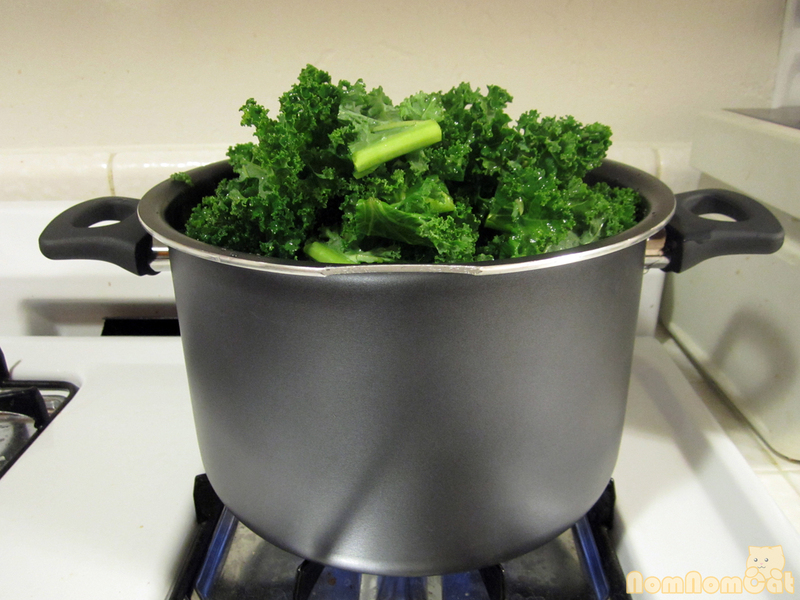 First rinse the kale leaves under cold running water. Cut or shred into pieces (I used scissors and sliced every inch or so along the leafy part and every 1/2 inch along the stem part). In a pot, heat a bit of olive oil. Toss in the kale. It’ll look ambitious at first, but trust me, it wilts down. Season with salt and pepper (we used Himalayan pink salt which adds a more delicate flavor and interesting crunch). Turn the kale; otherwise the leaves at the bottom start to burn while the leaves on top have yet to wilt. 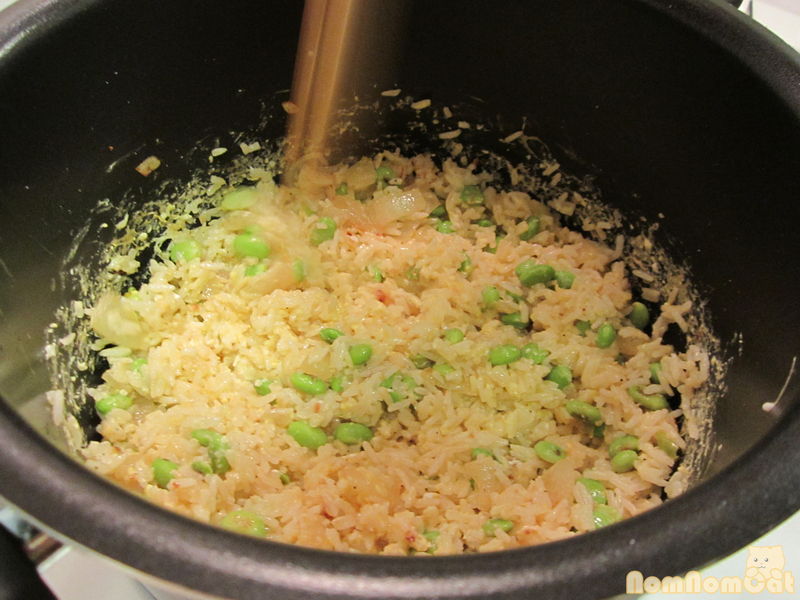 Add some minced ginger (or ginger paste!) and minced garlic for flavor. Serve the kale, juices included, over the bed of quinoa. I found a brick of “high protein, super firm” organic tofu at Trader Joes. This is PERFECT for stirfrying as the tofu brick is very dense and is less prone to breaking while cooking. If you can’t get your hands on this super (firm) tofu, any firm or extra firm will do. Be sure to pat dry with a paper towel after removing from the package. Cut into small bite-sized cubes and throw into a bowl. This is actually a whole brick, but we ended up with lots of leftovers.. 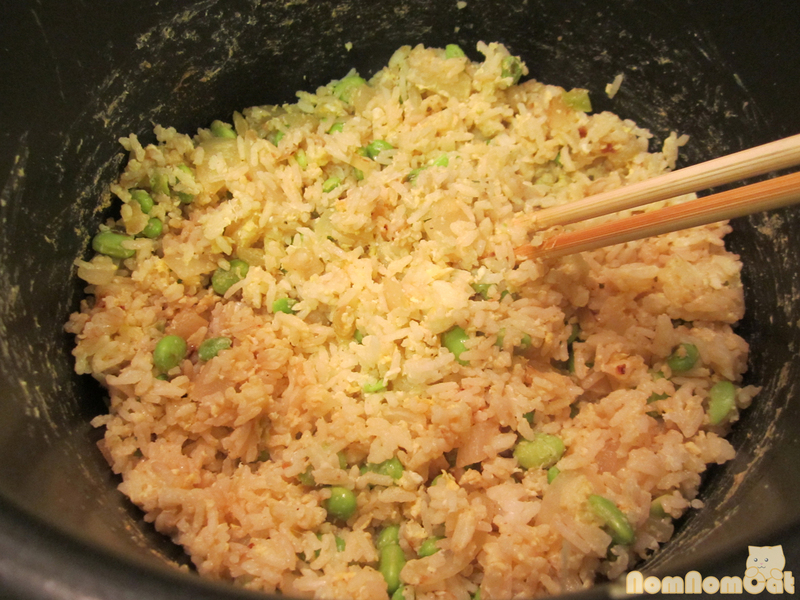 In a smaller bowl, mix together the mirin, soy sauce, and sesame oil. 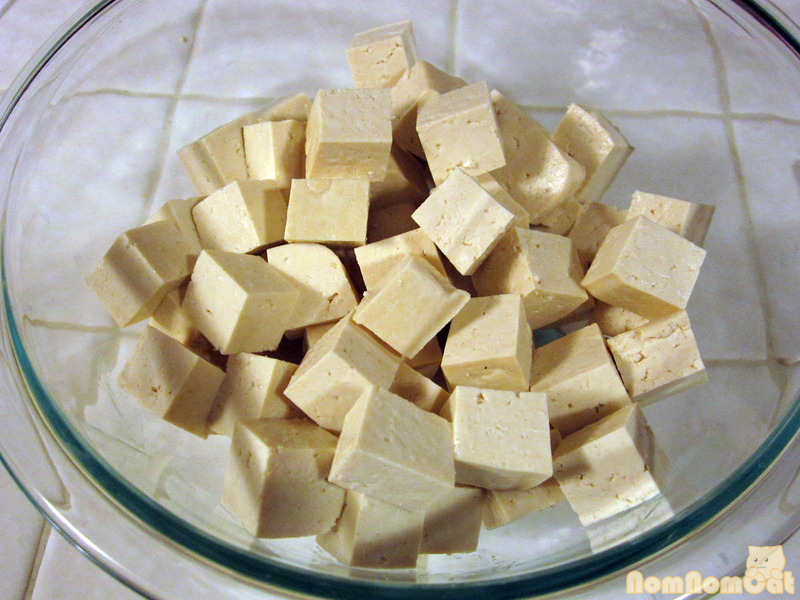 Pour over the tofu cubes and toss to coat. Meanwhile, heat a bit of olive oil in a pan. 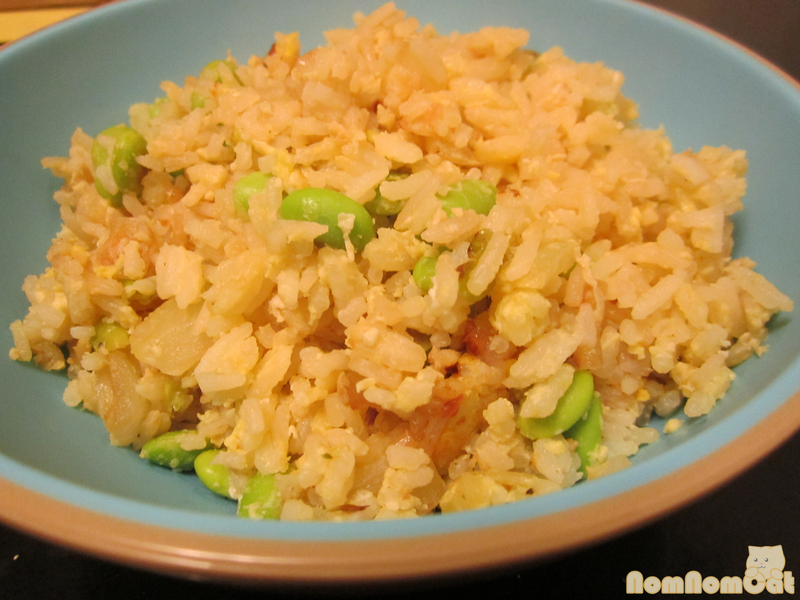 When the pan is hot, add the tofu cubes including any remaining “marinade” and let it fry/simmer until warm. 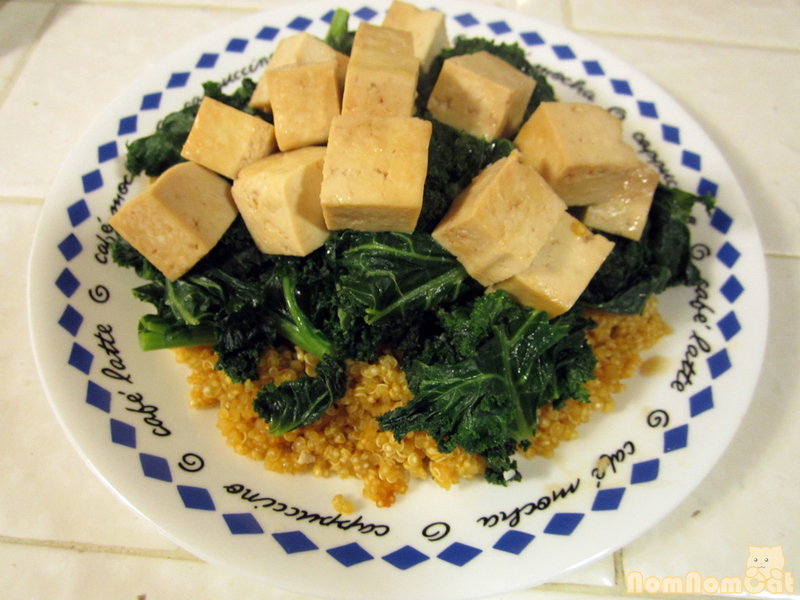 Serve on top of the kale and quinoa. Enjoy! It’s that time of year, when stores pack away the Halloween orange and black goodies and start setting out the winter holiday wares. Snowflakes, snowmen, Santa Clauses galore. What I had hoped to be a quick trip to Trader Joe’s to pick up some ginger chews turned out to be an exciting kid-in-a-candy-store feeling with all of the holiday items back on the shelves. 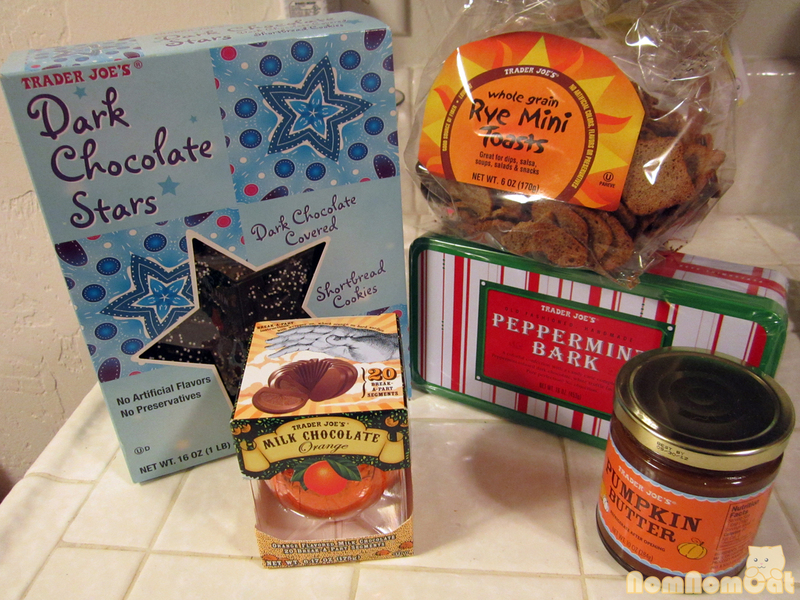 My spoils of war after battling the after-work crowd at Trader Joes! 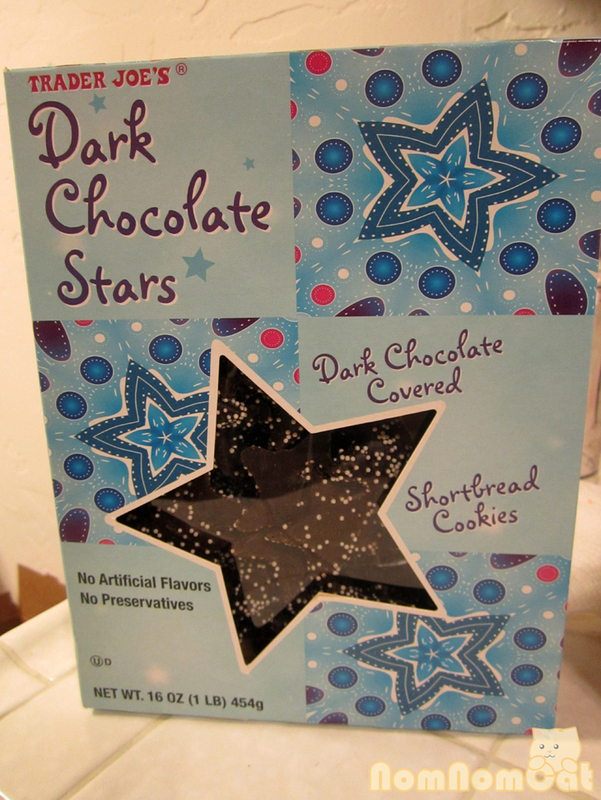 My favorite by far: Dark Chocolate Stars. Shortbread cookies dipped in dark chocolate and covered with white sprinkles. Think of those pink and white frosted Circus Animal cookies from your childhood… this is the grown-up version. I probably go through 3 or 4 boxes before the end of the season. (I daresay, I get even more excited about these than Girl Scout cookies!) A one-pound box sells for only $4.99! I hear they also make great cupcake/cake decorations! 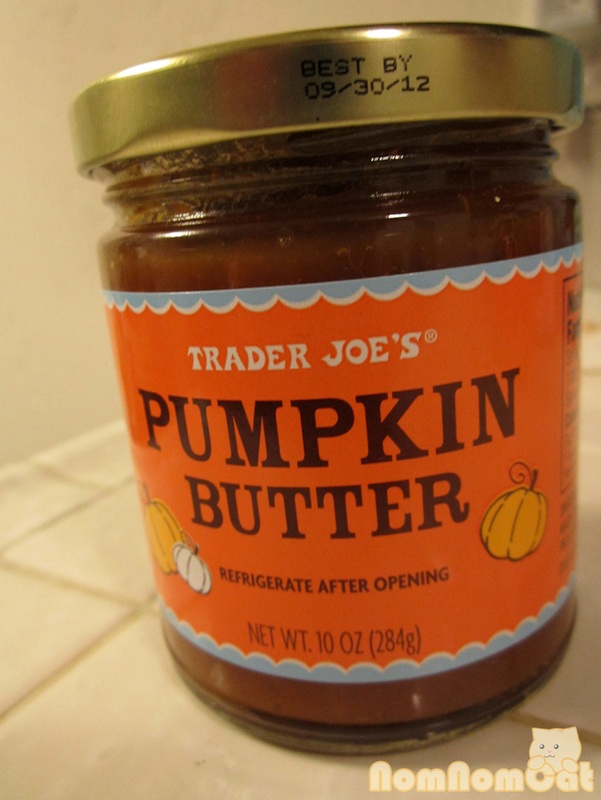 I also picked up a remnant of fall before they all get shoved aside to make room for winter: Pumpkin Butter. It comes in an adorable little jar and has the texture of a marmalade. Delicious on English muffins and all sorts of creative ideas listed on the jar such as “…pastry filling, poultry glaze, ice cream topping, on toast or mixed with fat free cream cheese for a unique spread.” $2.99 for a 10 oz jar. 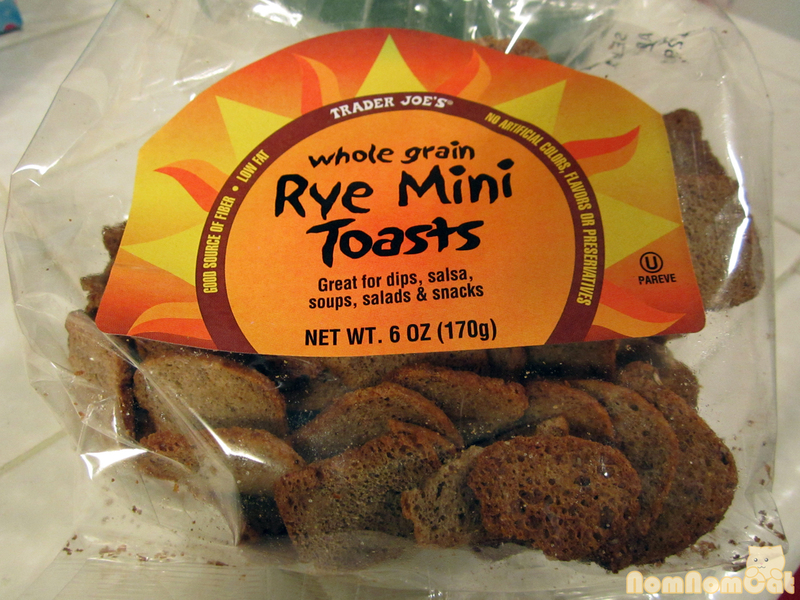 What I found out from my friendly cashier Colleen was that Whole Grain Rye Mini Toasts are also on the holiday list! She likes them on their own, but when I saw them, I immediately thought of making my own Chex Mix the way it should be – none of those darn pretzels or bread sticks that end up abandoned at the bottom of the bag. Just lots of rye chips and cereal, with extra zesty seasoning. Recipe to come! I’ll be stocking up on these before the season ends. $1.99 for a 6 oz bag. You’re my favorite part of Chex Mix, but shh.. don’t tell the cereal! Another winter staple is Peppermint Bark! Martin and I have a fondness for the squares from Ghiradelli, which don’t really resemble peppermint bark very much at all but are delicious nonetheless. I thought it would be a nice treat to welcome the dreary winter season with some festive peppermint bark in an adorable metal tin. 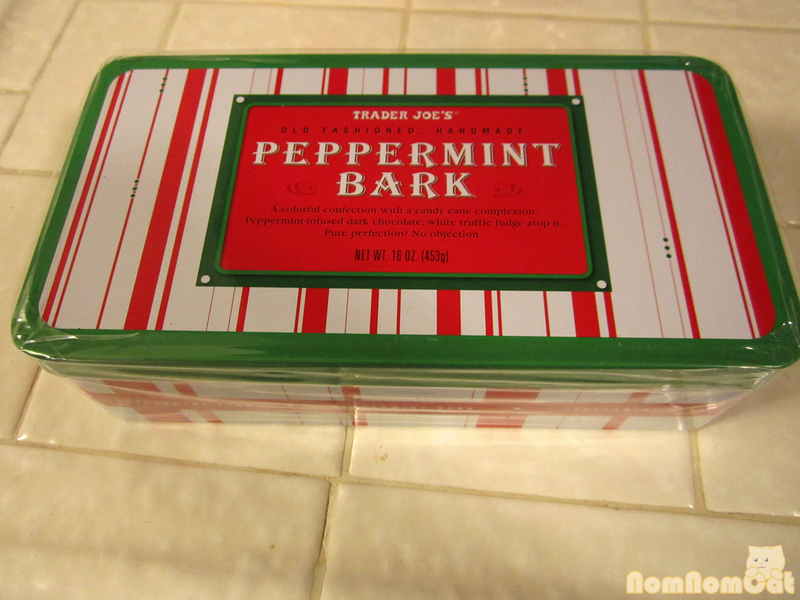 The tin holds one pound of peppermint bark and goes for $9.99. What an adorable little tin! 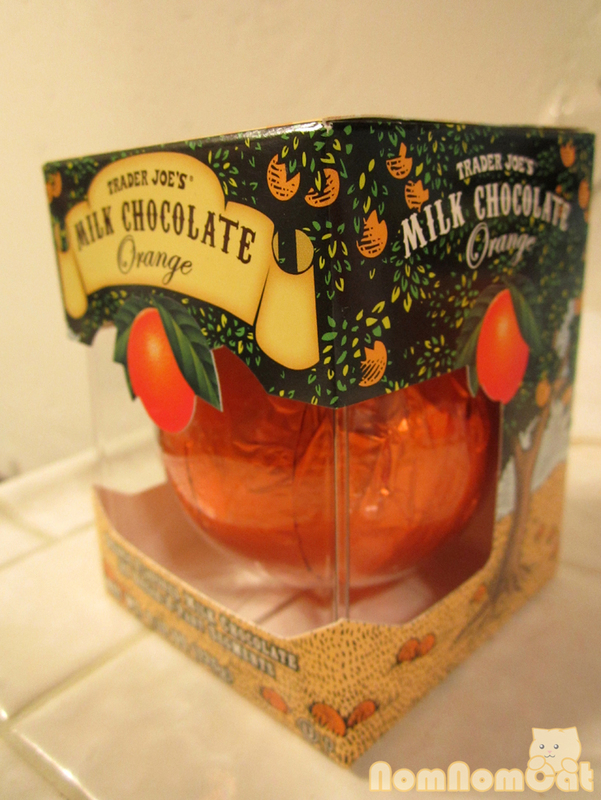 The last item I bought, ginger chews aside, was a Milk Chocolate Orange. Yes, my friends, those interactive spheres of chocolate that you WHACK against a hard surface to break into orange-like sections. Trader Joe’s has their own and we are very excited to try them! And at $2.49 apiece, it’s a steal! Can’t wait to take this out of the wrapper and *whack*! There are lots of other winter treats on the shelves this year as well. Even more than previous years, it seems to me. And of course since it’s Trader Joe’s, everything is very affordable and many of the items are organic. (I noticed on the label for the rye chips that they’re Kosher!) With shelves stocked full of gift boxes of truffles, peppermint coated pretzels, candy cane cookies, sparkling ciders in many flavors… ’tis the season!